“An old man, a young man and life’s greatest lesson.” This sentence is the topic sentence in this movie. 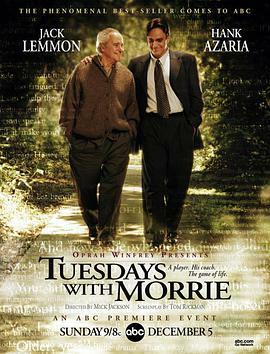 The story is about an old professor Morrie found he got a serious illness and would died.He appointed with his student Mitch to have life' lesson every Tuesday until Morrie die. After watching this movie, what impress me most is the sentence," once you learn how to die, you will learn how to live." To Mitch, Morrie is not only the teacher, but a man to change him and tell him the meaning of life. When Mitch and Morrie first met after 16 years, Morrie asked many questions to know Mitch's life. I think each question is valuable, we should also ask ourselves how can I answer these questions. For example, "Do you feel calm in when you stay alone? Were you a musician as you always hoped?" All of these questions are aimed at letting Mitch listen to his heart. What I remembered well is Mitch'words," No, I hadn't played the piano yet, now that I grow up." It's very though on the journey of pursuing our dreams and therefore many people fail. So did Mitch. He gave up his dream of being a musician, and became a reporter who had no time to relax himself and spent all his time on reporting. Maybe he could earn a lot of money, but I think money is not the only thing we should pursue. I hold the view that kindness and friendship are more important than money, so we should insist our dream and try our best to realize it. Morrie is always laughing and his optimism can not make others connect him with death. He taught us that dying is just one thing to ba sad about, and living unhappy is above. So we should be happy and be hopeful to life and be kind to life, then you will feel life is so sweet and you will learn the meaning of life.